By targeting the most massive galaxies in our universe, astronomers have studied how their stars move. The results are surprising: while half of them spin around their short axis as expected, the other half turn around their long axis. Such kinematics are most likely the result of a special type of galaxy merger, involving already massive, similar-mass galaxies. This would imply that the growth of the most massive and the largest galaxies is governed by these rare events. 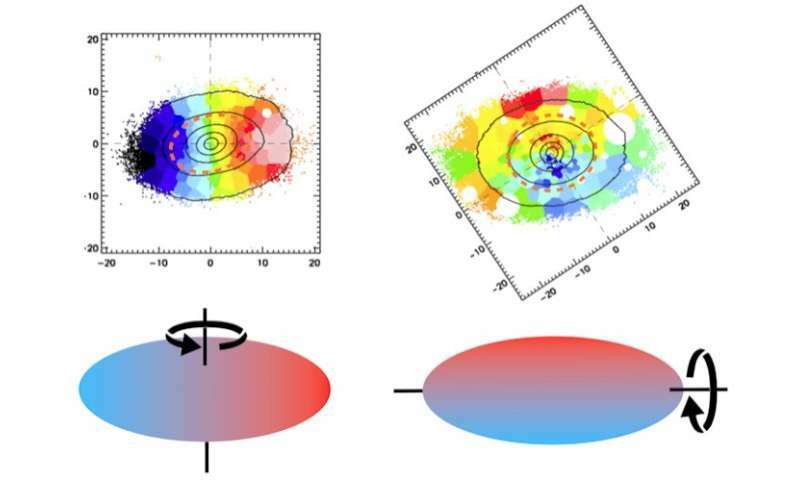 Measuring the way stars move within galaxies is a very powerful way of learning about the internal structure of galaxies, especially properties such as their three-dimensional shape and, ultimately, what their gravitational potential is like. To study the largest and most massive galaxies, a science team led by Davor Krajnovicfrom the Leibniz Institute for Astrophysics Potsdam (AIP) selected a sample of some of the brightest galaxies up to a distance of 800 million light years. These live in large ensembles of galaxies, within some of the most densely populated regions of our Universe, such as the Shapley Supercluster. They are also very bright and rare. The most massive galaxies are about one hundred times more massive than our own galaxy the Milky Way, which itself already has a stellar mass of 60 billion suns. They also have almost no gas, most of their stars are very old (at least 10 billion years) and do not form stars anymore. Unfortunately, these galaxies are too far from us to be resolved into individual stars and their motions. One can only look at the average motions of stars within certain regions. "This is what integral-field spectrographs are good at",explains Davor Krajnovic. "We observed these galaxies with MUSE, the wonderful integral-field spectrograph on the ESO's Very Large Telescope on Cerro Paranal in Chile. Massive galaxies can have all sorts of kinematics, some spin like frisbees, but most have no specific sense of rotation. We observed the most massive galaxies and found them to be different from other galaxies." The majority of intermediate-mass galaxies shows very regular stellar motions, as one would expect from discs like our Milky Way. In such galaxies, the sense of rotation is well defined around theshortaxis of the object; the angular momentum is aligned with the minor axis of an oblate spheroid. "We knew that about only 15% of the intermediate mass galaxies have irregular kinematics or even don't show much rotation at all", says Krajnovic. "For such galaxies, the sense of rotation is often not aligned with any of the symmetry axes of the galaxy, and these galaxies are of nearly spherical shape, or are elongated resembling rugby balls. Some of them have an interesting alignment and rotate around the long axis of the galaxy. Only a few cases of these were known." In this new study published in the Monthly Notices of the Royal Astronomical Society, the authors showed that these galactic "spinning rugby balls" are much more common than thought previously if one looks at the extremely massive galaxies, the high-mass end of the galaxy population. The result is interesting as it points to a very specific formation scenario for these galactic giants. Numerical simulations indicate that rotation along the long axis is indicative for a merger of two massive galaxies with similar size (and mass) when they are on special trajectories: sort of a head-on collision in space. Such galaxy collisions are violent events that completely reshape the internal structures of the progenitor galaxies. The remnant galaxies resemble spinning rugby balls. Stellar orbits also become much more complex, resulting in kinematics where the simple ordered motion is substituted with complex streaming around any of the three axes of a spheroid. The most massive galaxies are the end points of galaxy formation, and deservedly turn out to be the most complex stellar systems. This study helps us unveil the mystery of how the most massive galactic systems in the Universe come into existence. Easily explained in LaViolette's model, where galaxies are growing at an ever accelerated rate from ejections of new matter generated from within their supermassive cores. More and more matter spewing bipolarly along the spin axes then grow the galaxies preferentially in those directions, resulting in the rugby status in the most massive galaxies. Spirals grow into sphericals, then into rugby balls. It is a continuous process. Gas is newly formed at an accelerated rate as the core grows even more massive. Don't like it? Makes a merger maniacs head explode in rage at being so wrong for so long. Strike 55, and counting. LOL! Tux, you forgot to include Titus-Bode, Pythagoras & Philolaus as the basis of LaViolette's fabulist version of reality. You should have read this article with a little less prejudice. As the researcher's observed that in some galaxies there are major cross-currents of stellar movements. Speculated to have been caused by colliding galaxies of similar masses. Each mass interfacing along a separate axis. Those are recent observations with modern technology and methodical methodology. Contradicting your speculation of stars only forming in the centers of galaxies and then being squirted out. You remind me of that old joke about astrology. "An astrologer is the guy who hasn't been outside at night in four thousand years." The facts are accumulating that this universe is a cosmic wreck. A practical joke by cthonic deities drunk on chaos. All those rules you cherish? As you dictate to the universe to behave as you expect? Yeah? Good luck with that. Tuxford is a complete loon. It is pointless replying to his woo. Just a wee bit of advice for the unwary.